There’s no shortage of restaurants along Stanley Street, but given the crowds that descend there every lunch and dinner, the more the merrier. Ueda Washoku Lounge joins the chaos on the third floor of 11 Stanley, where different restaurants occupy nearly every floor. As we discover, however, there’s good reason to choose this Japanese fusion spot over others. High ceilings with glass windows add to the airy ambience of this restaurant, with clean lines alongside wood and steel tones, estblishing a relaxed vibe. 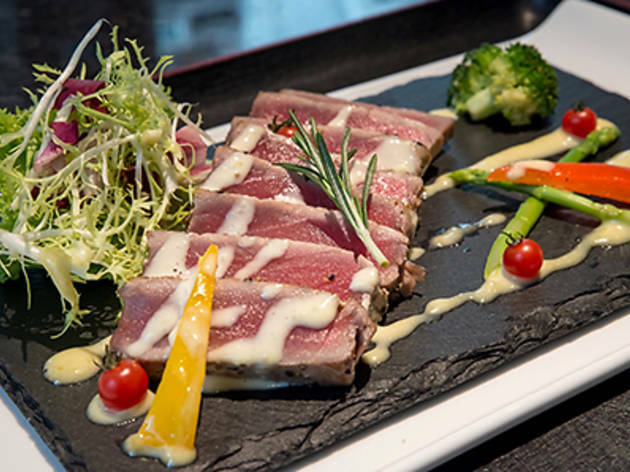 The menu is laced with decadent fare, from foie gras to wagyu, and we make sure to select both. Expertly sautéed, and sitting pretty over cubes of boiled daikon radish, with teriyaki sauce tying everything together, the foie gras ($168) is a pleasing fusion and a great start to the meal. Before moving on to the beef, we try the Ueda-style fish and sweet potato chips ($138). Using sea bream, the fry-up is a success – the robust texture and neutral flavour of the fish allows its seaweed-infused batter and accompanying ume mayonnaise to play on the palate. Up next is the stewed Kagoshima wagyu ($238), plated in its own broth alongside stalks of asparagus and eggplant. 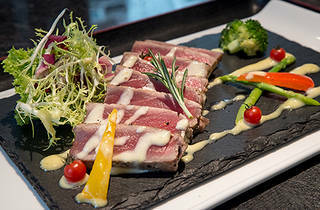 Favouring fattier cuts of beef, this dish is well prepared, but perhaps lacking in imagination compared to the entrees. Similarly, the Ueda noodles ($118), which can be ordered with either duck meat or vegetables, doesn’t follow in similar fusion footsteps. Disappointingly, the duck meat is very dry, making us wish we chose the vegetable option. To wash everything down, we enjoy a matcha-infused beer ($88) – a simple and surprisingly subtle combination, and just one of several reasonably priced drinks. Another cocktail we sample is the sake mojito ($88) which, while not about to win any mixology prizes, was sufficiently minty and boozy to get the required job done. Ueda Washoku Lounge & Dining 3/F, 11 Stanley St, Central; 2327 4482; fb.com/ueda.hk.